This was the match which gave birth to the term "the Ashes", though it was in fact the ninth between the two countries. It was an exceptionally low-scoring game, resulting from the wet weather and a pitch which would probably nowadays be deemed unplayable. (It should be remembered that until the 1950s pitches were left uncovered during a match, and in consequence some surfaces made batting extremely difficult). Massie, opening Australia's second innings, was the only batsman to reach 50. England, needing only 85 to win, were destroyed by Frederick Spofforth, the original "demon bowler". The great W. G. Grace scored 32, but only two other Englishmen reached double figures. This is the first of only two occasions when a team following-on has won a test match (for the other one, see later). Australia opened the match with a huge total, and England set them only a modest target to win; but then it rained overnight, producing a classic "sticky wicket", on which the Australians found Bobby Peel's left-arm spin almost unplayable. Giffen's immense all-round performance went unrewarded. England, set a moderate total to win the match, collapsed to 48 for 5. Gilbert Jessop then smashed his way to what is still the fastest century in Ashes tests, but when the 9th wicket fell, England were still 15 short of their target, and it was left to the Yorkshire pair of Hirst and Rhodes to see them home. This match could have been influenced by the weather, but wasn't. The England second innings had to begin on a very dangerous drying wicket, but Jack Hobbs and Herbert Sutcliffe defied the conditions with an opening partnership of 172, and eventually England won easily. Wilfred Rhodes had been recalled to the team at the age of 48, and responded with six wickets in the match. This victory gave England their first series win against Australia since before the First World War. England witnessed the awesome run-scoring power of Don Bradman for the first time. Despite scoring 400 on the first day, with a brilliant century from the young Indian prince Duleepsinhji, England were overwhelmed as Bradman then reached 250 in less than six hours. In the second innings Grimmett chipped away at the England batting with his leg-spin, while Percy Chapman, England's captain, threw caution to the winds with a hard-hit century. Sir Neville Cardus, looking back on it many years later, described it as "the ideal cricket match". It was certainly action-packed: 1600 runs being scored off almost 500 overs in less than four days of cricket! This is immortalized as "the bodyline test". 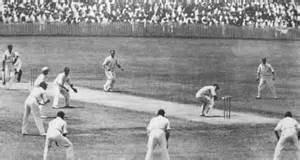 To counter the menace of Bradman, Harold Larwood, England's fastest bowler, was instructed to pitch short and aim at the batsman's body, with no fewer than six short-leg fieldsmen clustered round for a catch. 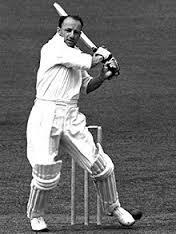 (We should remember that batsmen in those days had no helmets and no body-armour). The Australian captain, Bill Woodfull, was struck several times, to the disgust of the crowd, and the wicket-keeper Bert Oldfield suffered a fractured skull when he top-edged a pull shot onto his forehead. Bradman was too quick on his feet to be struck, but it reduced his run-scoring to merely mortal levels. 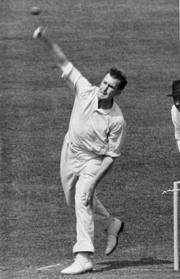 (Oddly enough, England's most successful fast bowler in the match, Gubby Allen, did not bowl bodyline). The whole episode led to an angry exchange of telegrams between Australia and England. This match was one-sided from start to finish, but is remembered for Jim Laker setting a record unlikely ever to be beaten, with 19 wickets. The Australians were wholly unable to cope with his off-spinners on a helpful surface. This is only the second occasion in which a team following-on has won the match. After losing the first test badly and drawing the second, England recalled Mike Brearley as captain. The position appeared hopeless as England were reduced to 135 for 7 in their second innings, but then Ian Botham and the tail added more than 200 with some vigorous hitting, enabling Bob Willis then to blow away the Australian batting. This is always remembered as "Botham's match", but Willis's role at the end was just as important. The 2005 series is generally reckoned to be the best of recent years. Australia won the first match, and almost won this, the second. England were well ahead for the first four days, and the fifth looked to be of short duration, with Australia on 175 for 8: over 100 behind. But then Warne, Lee and Kasprowicz brought them within three runs of victory, before finally Kasprowicz gloved a ball from Harmison down the leg side and was caught behind. (To add to the interest, later video analysis suggested he shouldn't have been given out!). Andrew Flintoff was adjudged "man of the match", but if the result had gone the other way the award would surely have gone to Shane Warne.